If you have been reading our reviews for some time, you probably know my love for puzzle games. My three-year old son, Philip, also shares my preference for puzzle; his favorite games include Beyond Ynth, Amazing Alex and Bad Piggies. Today, I will share with you another game that I enjoy playing so much, and believe that Philip will like as well. Called Flea Symphony, this fantastic musical game has a unique gameplay, beautiful graphics, and excellent animations. 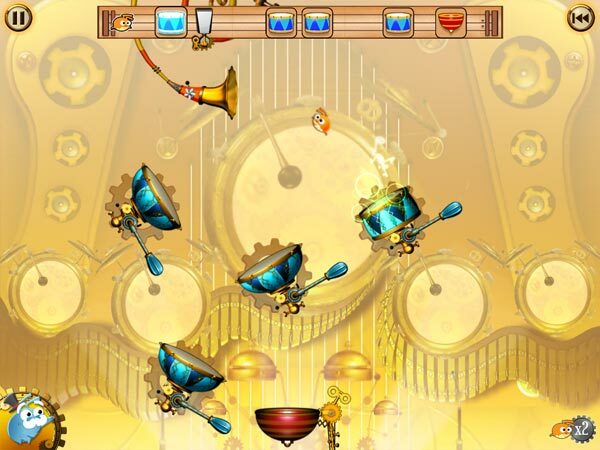 The first few levels in the game introduce you to new game components, such as drums that can be rotated. Flea Symphony is a unique musical puzzler that uses real-time physics mechanics. Its back story is about a group of fleas who are determined to save the music shop they have been living in from going out of business by creating the perfect musical compositions to keep customers coming back. Consisting over 100 levels, the game is a challenge to play. Each level starts with a sheet music showing one or more drums interspersed to create a unique tempo for the musical compositions. After a flea is launched from the bell of a horn, it will try to bounce itself on the drums according to the tempo outlined in the sheet. As you play further in the game, you will be introduced to other equipments, such as guitar strings and tuba cannons that can be used to control the movement of the fleas. 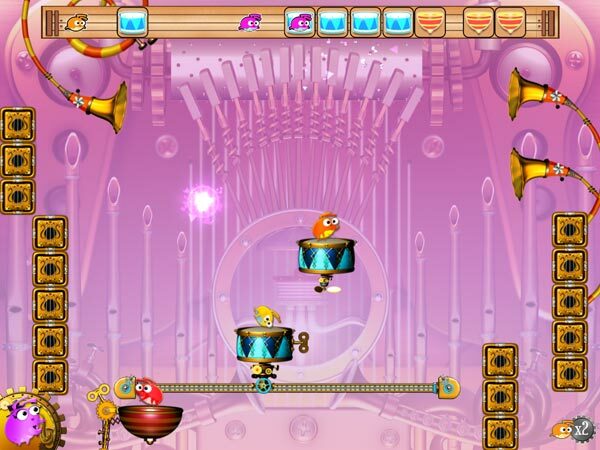 Similar to actual musical composition where tempo is a crucial element, Flea Symphony also emphasizes on the adherence of musical tempo in the gameplay. Even though you are able to bounce the flea from one drum to the next until it reaches the red bucket, the level won't be considered complete unless you hit those drums in the correct tempo. The first few levels outline the basics gameplay and introduce some of the basic game components. As you progress through the game, you will find drums that can be slid along a track, musical instruments that can be rotated, switches that can modify the platform for a small period of time and green gasses that can be lethal to the fleas. These components are introduced gradually to ensure that you find the game continually challenging. 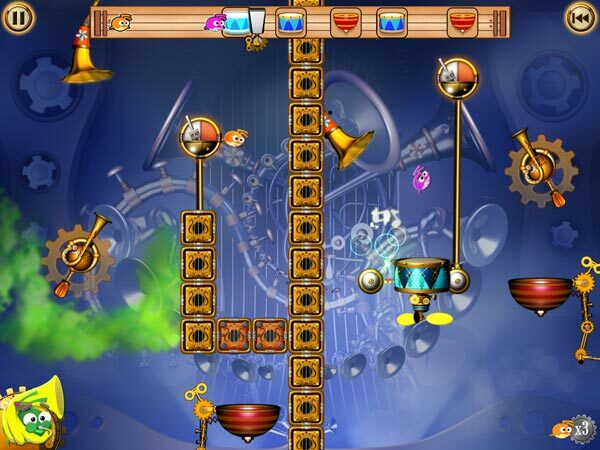 Unlike other puzzle games where positioning and/or planning are the only key success factors to solve challenges, Flea Symphony adds a real-time aspect to the gameplay. In the more complex levels, you need to constantly change the configuration of the components to make the fleas bounce around according to the tempo. It would be good if you learn play with two fingers simultaneously, because there are cases where it would be to finish schallenge with a single finger. Since tempo is a crucial component in this game, adding the number of fleas in the level can increase the complexity considerably. There are many levels where you need to control the tempo by bouncing two or more fleas at the same time. If you're playing with three fleas, you might get the feeling that you're playing a game of Arkanoid — the angle of the fleas bouncing off the drums are quite similar to how the balls in Arkanoid would bounce off the pedal. More complex levels can feature up to three colorful fleas bouncing around simultaneously. Other than the excellent real-time aspect of the puzzles, I really apprecaite the beautiful graphics, detailed animations, and excellent sound effects. The developers really delivered an awesome gaming experience with this game. I can't wait for the next update to this game and any other future games from the developer. The game is also really gorgeous. If you own a Retina iPad, I would suggest you to download the Retina asset pack, which is available as a separate download. The developers cleverly excluded these from the normal download to minimize the download size for non-Retina iPad owners. I personally haven't seen any other apps that use this approach before. The more complex levels may include the lethal green gasses, rotating tuba cannons, switches that can change the platforms and of course, two or more fleas bouncing around at the same time. Flea Symphony is an awesome and fun musical puzzler for all ages. The real-time aspect of the gameplay and the fact that you might need to play with two of your fingers simultaneously while solving the challenges will keep you excited. Just remember, timing is everything in this game. I highly recommend this beautiful game for anyone who's looking for a great casual game to play with.